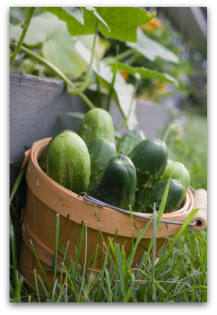 Learn how to grow cucumbers in a backyard vegetable garden or in a container garden. We offer easy tips for planting cucumber from seeds or transplants, and the best methods of growing cucumbers using a cage or trellis for support. 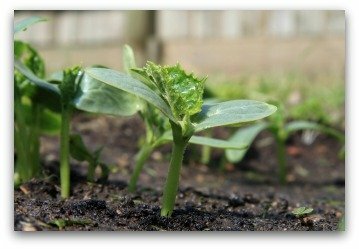 Cucumber seeds or transplants should not be planted outdoors in the garden or in containers until all danger of frost is past. If an unexpected frost arrives after your cucumber plants are in the garden, cover them with an overturned bucket or other container to protect the plants from frost damage. Don't cover them with plastic sheeting, as the cold will transfer through the plastic onto the plants. Fabric works well to protect plants; just be sure it isn't plastic. When purchasing cucumber plants at the garden center, try to find the plants in peat pots that are biodegradable and can be planted in the ground container-and-all. The survival rate of cucumber transplants is higher when they do not have to be handled by removing them from a container. Cucumber seedling roots are very delicate, and are easily disturbed when being handled. To start cucumbers from transplants, plant the seedlings inside the black plastic mulch you have laid down in the enriched vegetable garden bed. Using a spade or garden knife, make a slit in the ground cutting through the plastic. I usually cut an "X" with my knife, as it makes a larger hole that is easier to work with. Cut the plastic and push the edges of the plastic into the slit. Gently peel back the top of the peat pot that holds the seedling below the soil line. Plant the pot directly in the soil under the plastic mulch. For rapid growth, water the transplants with a mixture of water and foliar fertilizer. A good way to grow cucumbers and save vegetable gardening space is to train cucumbers up a cage, trellis or fence. 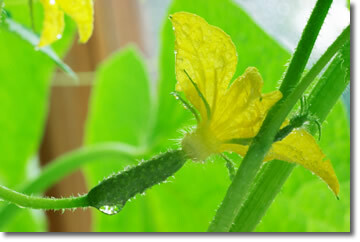 Set the cucumber plants out at two to three feet spacing between plants. 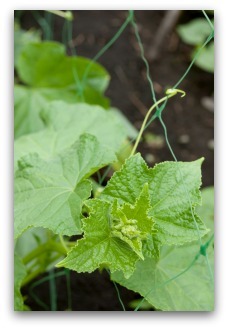 Add a wire cage, or wooden trellis near or over each cucumber plant. If needed, train some of the first vines onto the trellis. Usually the cucumber plant will find the trellis on its own, as they like to climb! The trellis will help you be able to see your cucumbers more easily, as they like to hide and grow under the leaves! Growing cucumbers on a trellis also help shade the plant-roots during hot weather. We notices this when we found "volunteer" cucumbers growing near our compost pile. They sprouted from over-grown cucumbers that had been added to the compost pile. If you decide in July to plant a second cop of Burpless Hybrid or another favorite variety, try to grow cucumbers from seeds planted at the base of the compost pile. 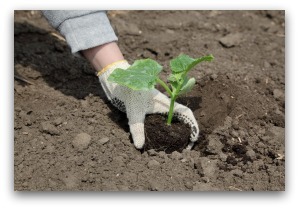 Begin by working some compost into the soil and adding a bit of 5-10-5 fertilizer. Drop the seeds in at 3 inch spacing, cover the seed with around ½ inch of soil, and keep moistened. Put a trellis up against the compost bin. When the seedlings come up, thin the plants to the strongest one at approximately 2-3 feet spaces and train them to climb up the structure. Depending on growing conditions and your local frost dates, you could grow cucumbers through September and October using this method. Typically most gardeners change their gardens a little each year, add a plant here, take away a planting there. We hope you do the same to spice up your plantings. To give you some idea of favorite varieties we have listed a few that are suitable throughout the country as a guideline. The main requirements when purchasing seeds is that the plants suit your soil, family's taste, and local weather conditions. Favorites include: Sweet Slice, Victory Hybrid, Burpless Hybrid, and for pickling BravoHybrid. 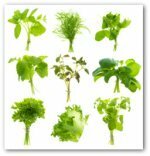 If ground space is unavailable, container grown vegetables have quite a bit to offer the vegetable gardener in the way of fresh grown produce. 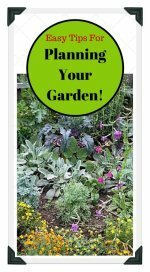 The benefits include portability, attractiveness, and low maintenance compared to traditional gardens. It is possible to grow some varieties of cucumbers successfully in containers. There are no differences in the timing of ground planted crops and those raised in pots on decks or patios. While the same information we share on growing cucumbers in the outdoor garden pertains to container vegetable gardening as well, special attention does need to be paid to the size pot chosen. 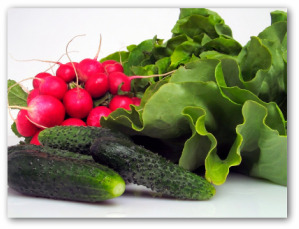 * Pot-grown vegetable kept outdoors dry so quickly that choosing a larger container is an advantage. * A good container choice to grow cucumbers in is a large plastic pot about twice the foliage size with two drainage holes, filled with 1/3 peat moss, 1/3 compost, and 1/3 sand. A 5 gallon container is usually adequate. * Add a 14-14-14 slow release fertilizer. Or you can use a fertilizer-enriched ready-made potting soil to fill the container. * Watering properly is a critical element to maintaining a successful container garden. You may need to water more than once a day under dry weather conditions. Fertilize every week with a water soluble fertilizer.